QuickScan DL will be a great addition to your current product line because it allows you to easily generate continual income! The clients to whom you sell a QuickScan DL license will also purchase a subscription from you for the news data that you'll provide for them using your QuickScan ProMedia system. This data may reflect a library tape (or CD) that you are maintaining or it might just represent a database of news stories that are important to your client. With QuickScan DL your clients can perform searches on their own data and create their own custom, in-house reports and all you'll have to do is email them a file each week (or at whatever interval you and your clients choose). Then just send the invoice. 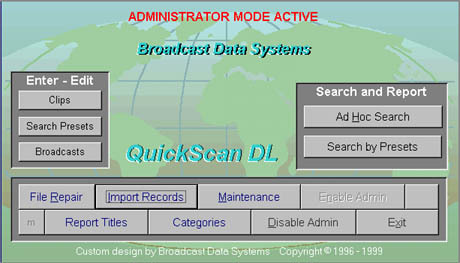 Unlike QuickScan ProMedia or QuickScanJr, there is no way for records (news stories) to get entered into the QuickScan DL database other than with a DL-type file, which can only be provided to the QuickScan DL user by a licensed news monitor. 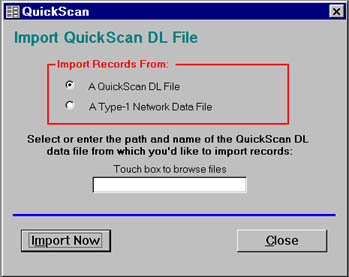 QuickScan DL has the same system requirements as QuickScan ProMedia or QuickScanJr Plus. QuickScan DL is reasonably priced. Sell it to your client or buy it for your client and include it as part of their subscription.